Goodnight Fayetteville is a colorful, children's book that featured the unique places and events that make Fayetteville, Arkansas a wonderful place to live, work and play. This booked is based on the popular children's book, Goodnight Moon. Art teachers in the Fayetteville Public School District illustrated the book. 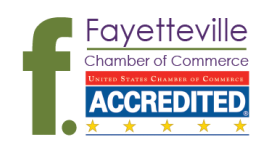 The Chamber is committed to leadership development in the Fayetteville Public Schools and each book purchased will help ensure that these programs are expanded throughout our public schools well into the 21st century.